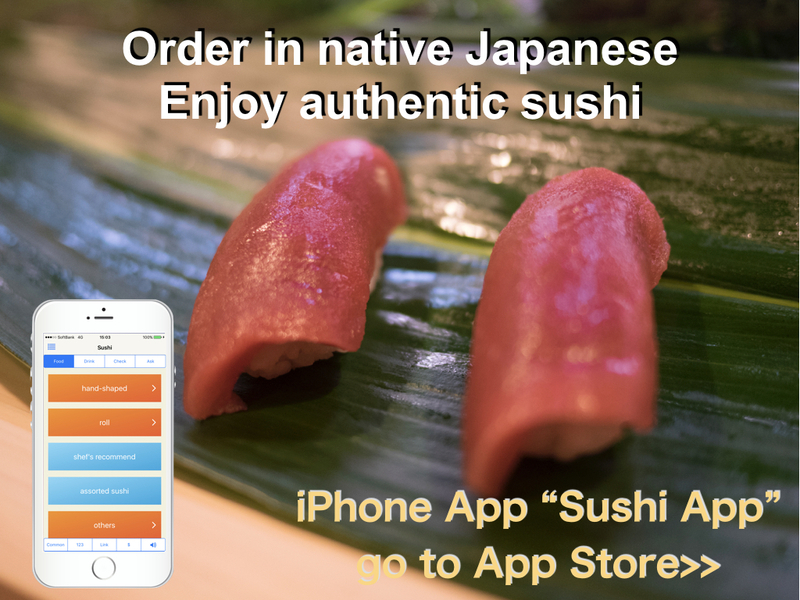 Oyster (Kaki in Japanese) is one of popular seasonal foods in the winter. 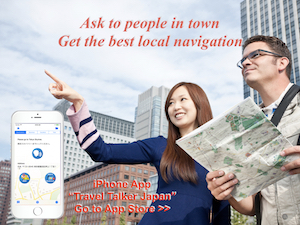 It can been seen at stores from mid of autumn to the end of winter. 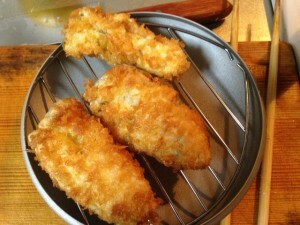 I was thinking that I would make Kaki Fry (Fried Oyster) in this winter. We had a lot of snow fall twice in Tokyo last month, February. It was 20 to 30cm fall and the record since several decades ago. However I thought this winter will continue for a while, at the end of last month, temperature went up to 18 degree (c). It’s almost spring! So I decided to make Kaki Fry soon because I can’t wait next season. 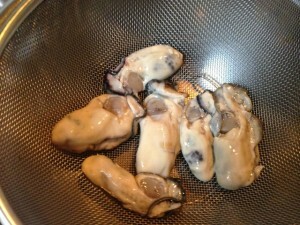 1) Wash Oyster in the water well and leave it in strainer to remove moisture for a while. 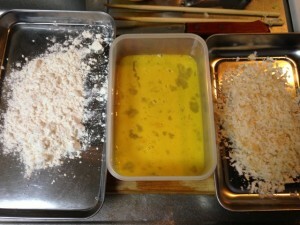 2) Prepare Flour, Egg and Panko in different boxes. 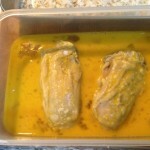 Pour oil in the pan about 2 to 3 cm depth and heat up to about 170 degree (c). 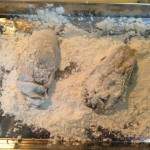 4) Coating the Oyster with Flour, place it in Egg, then coating it with Panko. 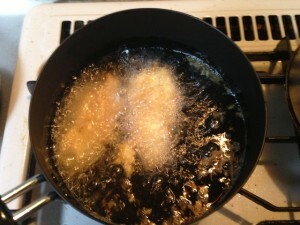 5) Fry the Oyster until it becomes golden brown. Temperature is about 170 – 180 degree (c). 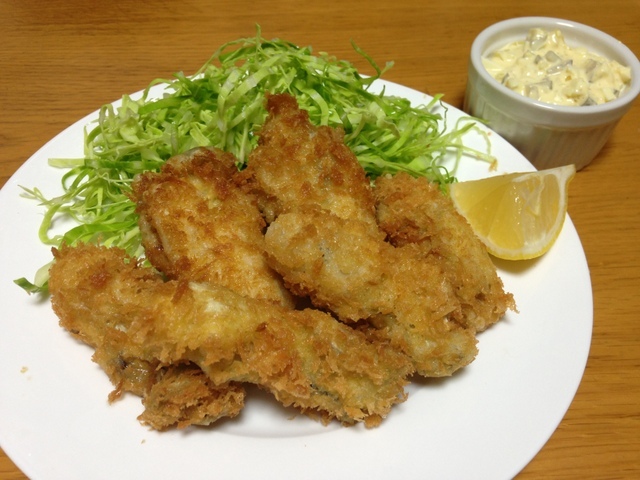 Serve Kaki Fry with Tartar Sauce and Lemon. If you have read the article about Ebi Fry (Fried Shrimp) or Tonkatsu (Pork Cutlet), you will find these cooking methods are as same as this one. 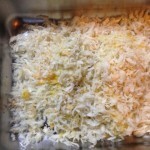 Most foods called something + Katsu or Fry are made with almost same method. I think this can be also categorized Yoshoku. Kaki Fry was the food which I ate Oyster first time when I was a child. I though it was very delicious and I liked it. My mother cooked it several times, but I felt something wrong one day. The Oyster seemed to be a little bit old. Then I couldn’t eat oyster until I became adult. Now I enjoy oyster foods not only Kaki Fry, but also other such as raw or saute. Eating raw oyster, we usually with Ponzu and Momiji Oroshi like Fugu Sashimi (Teppo). To saute, I think using butter or butter and soy sauce are popular. Recently, we need to take carefully when eating raw oyster because of Norovirus. I have to pray no such virus in the oyster.